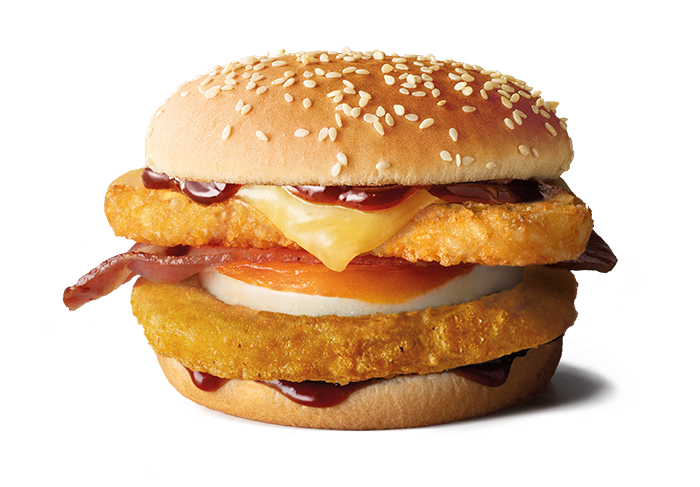 The all new Big Brekkie Chicken Burger with bacon, a freshly cracked free range egg, tasty cheese, hash brown, BBQ sauce and made with New Zealand chicken breast sourced from Ingham® all between a sesame seed bun. Breakfast just got bigger! McCHICKEN PATTY: Chicken, Flour (Wheat, Maize), Water, Vegetables Oils (Canola, Maize, Palmolein), Salt, Thickener (1404), Spices & Spice Extracts (Black Pepper, White Pepper, Cayenne Pepper, Paprika, Turmeric, Sage, Nutmeg, Celery, Capsicum), Dehydrated Vegetables (Garlic, Onion), Maize Starch, Soy Protein, Mineral Salts (450, 451), Raising Agents (500, 541, 341), Maltodextrin, Emulsifier (433), Herbs (Sage, Marjoram, Thyme, Rosemary, Parsley).QUARTER BUN: Wheat Flour, Water, Sugar, Canola Oil (Canola Oil, Antioxidant (330)), Sesame Seeds, Iodised Salt, Wheat Gluten, Improver (Mineral Salts (516, 170), Wheat Flour, Emulsifiers (472e, 481), Enzymes (1100, 1101, 1102, 1104), Antioxidant (300)), Preservative (262), Yeast (Yeast, Water, Thickener (415)), Emulsifiers (471, 481), Malted Barley Flour, Dough Conditioner (Mineral Salt (516), Wheat Flour, Antioxidant (300)), Emulsifier (481), Processing Aid: (Enzyme(1101)).HASH BROWN: Potatoes, Canola Oil, Dextrose (Maize), Seasoning (Black Pepper, Salt, Modified Corn Starch).EGG: Egg.SOUTHERN STYLE BBQ SAUCE: Water, Tomato Paste, Invert Sugar Syrup, Sugar, Vinegar, Apple Puree, Thickener (1422), Salt, Worcestershire (Fish), Colour (150c), Onion, Garlic, Spices, Preservative (202), Vegetable Gum (415), Smoke Flavour.CHEDDAR CHEESE: Pasteurised Milk, Salt, Cultures, Enzyme (Rennet).BACON RASHER: Pork, Water, Salt, Sugar, Emulsifiers (451, 450), Dextrose (Maize, Tapioca), Antioxidant (316), Acidity Regulator (330), Sodium Nitrite (250), Rosemary Extract. Smoked.SPRAY OIL: Canola Oil, Emulsifier (322-Soy), Flavour, Colour (160), Acidity Regulator (330).OIL VEGETABLE: Vegetable Oil, Food Acid (330), Antifoam (900).Contains gluten, egg, fish, milk, sesame seeds & soy. May contain TRACES of sulphites.